So…it the ‘mom’s new year’ as many people call it. August is the time when moms all over regroup from the leisurely days of sleeping in, pool fun and all other summer activities. Regrouping involves a shift in mindset back into routine and structure, but it often involves getting up earlier, having to get breakfast prepared and lunch boxes packed, in a hustle to get out the door on time. I’ve always been a bit of an efficiency nut. I like things to run smoothly. (As much as they can when there are 4 boys who act like electrons most of the day…bouncing from here to there and everywhere.) We have a spot for shoes. Another for backpacks. We have lunchbox area. And homework folder location. And Ryan’s glasses are always in the tray on the front table. When everyone knows where everything is, it makes the morning rush bearable. Another thing that really helps me in the mornings is that the older 2 boys can prepare their own breakfast. Sometimes they make eggs. And now, they can make their own oatmeal. For the cook ahead option, I will make 3 cups of dry quick cooking oats (plus other ingredients x3) and that will make enough portions for 2-3 breakfasts during the week…depending on who eats the oatmeal. (Often times, baby, Tyler and I eat a round-2 breakfast after school dropoff.) You can make however much you need for your family, and then divide into single serving containers and keep refrigerated. Then just reheat and add some milk or yogurt and serve with fresh fruit…yum! I recommend the Rubbermaid 50-piece food storage, as it has several of the smaller-medium size containers that are perfect portion for kids-adults. For the packets, I use sandwich size plastic baggies and reuse them when it’s time to restock! Oh, and use gluten free certified quick cooking oats if you are GF! Combine all the ingredients in a sandwich size plastic baggie. Seal tightly and store up to 2 months in the pantry. To cook: Bring 2 cups of water to bubbling, then pour in the contents of the baggie. Stir well and reduce heat to medium and cook for 2-3 minutes, or until thickened. Serve Oatmeal with milk or yogurt and fresh fruit. Sugar-free option: Omit the brown sugar and stir in 2 Tbsp maple syrup while the oatmeal is cooking. Will this work with regular oatmeal? Absolutely! I like to add 2-3 tablespoons powdered milk to the mix. I use stevia to sweeten it–diabetic friendly. What does this oatmeal taste like? Like the oatmeal spice? I’m going to try these with Joshua since he loves the pre-made packets. Thanks for the recipe! Do you use the microwave to cook it? If so, what do you recommend as far directions too for heating? Has anyone tried making these using a microwave? Was thinking if husband could take to work, in a mug, add water and microwave. I just didn’t know how long, or if the oatmeal would be mush, etc. I always use the microwave. I prepare mine at work and just dump it in a cup. I heat it for about 1 minute to 1 minute 30 seconds. I am confused is the ingredients are per packet or for 4 packets. Can someone help? 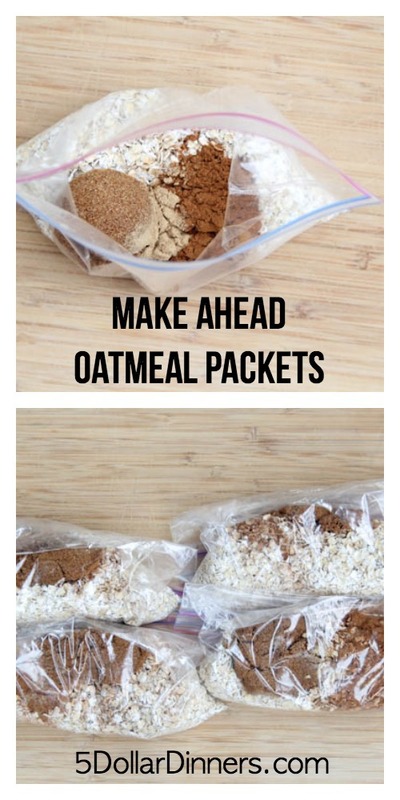 Jaime- it looks like this is for one serving, since the ratio for oatmeal is 2 cups water to 1 cup oatmeal. It says one packet makes 4 servings. One cup of uncooked oatmeal will end up as 2 cups cooked and that is a lot for one person. I don’t understand what the use of ginger is for , what kind do you use?